I’m not certain why anyone might want this product, but perhaps it has something to do with our constant need for comfort. Toshiba has come up with a toilet seat that really is the ultimate in luxury for those who want it in the place where it might not be. There is much to be said for this, like its use as a warm water bidet. I presume that it has something to do with our need to have our butts doused with warm water after we use the sit-down feature. Speaking of sitting down, the seat is heated. That is good, because generally that porcelain is a little freezing from time to time, even with the heat up at full blast in the bathroom. Believe it or not, the toilet seat has a remote control. Boy, I’ll bet you are going to forget where you put that one. I am assuming that the control operates its automatic lid opening feature I’ve heard so much about. However, the best feature is its energy-saving feature. The heat retention saves 55 percent energy compared to other electronic toilet seats, but none are coming to mind as of right now. 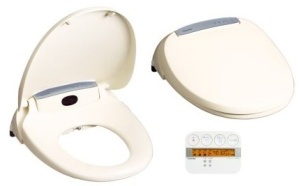 I’m not sure of the date or availability of this toilet seat from Toshiba just yet.